The Rule of Thoughts, sequel to The Eye of Minds by James Dashner, launched on August 26, and the author chose to spend his launch day at OUR Barnes & Noble. 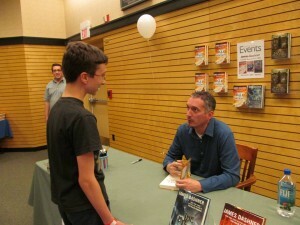 I have a son who loves his books and was so excited to see him in person, and Dashner did not disappoint. He spoke to the full house audience about the major motion picture The Maze Runner opening September 19, which is based on his New York Times bestselling book. It’s highly unusual for an author to be pleased with a movie adaptation of his book. According to Dashner’s agent, the best he can hope for is that the author “won’t hate it”. But Dashner’s overwhelming excitement and endorsement for The Maze Runner movie came through so loud and clear that we can’t wait for it. He spoke of his involvement with the project from consulting on the script to visiting the set to being present for the recording of the soundtrack. He is pleased with how well the movie sticks to the book, while also being impressed with how some parts of the book had to be made more visual for a movie audience. Question-and-answer time followed, which spurred him to talk a lot about the writing process. He nailed it when he said we writers are “insane in the brain”. For me, it was intense fun to hear him say all the same things I feel as a writer: that we develop our characters based on parts of every person we see and meet, every conversation we hear, every mannerism we notice in others; that we can sit in front of the keyboard for an hour trying to come up with the next words, then put our fingers on the keyboard and suddenly something just pours out that was totally unplanned but spectacular; that we love all of our characters, even the bad ones, and we feel all the emotions our characters feel. He even said that he visualizes his books as movies as he’s writing them and so writes in a cinematic way, just as I do. Writing can be a very lonely endeavor, so to hear that James Dashner experiences all the same things I do created such a unifying, feel-good moment for me. Check out his latest book, The Rule of Thoughts.